The Pierpont-Ginn House. After the death of her husband in 1905, Josephine Pierpont married the San Francisco publisher Frederick Ginn. 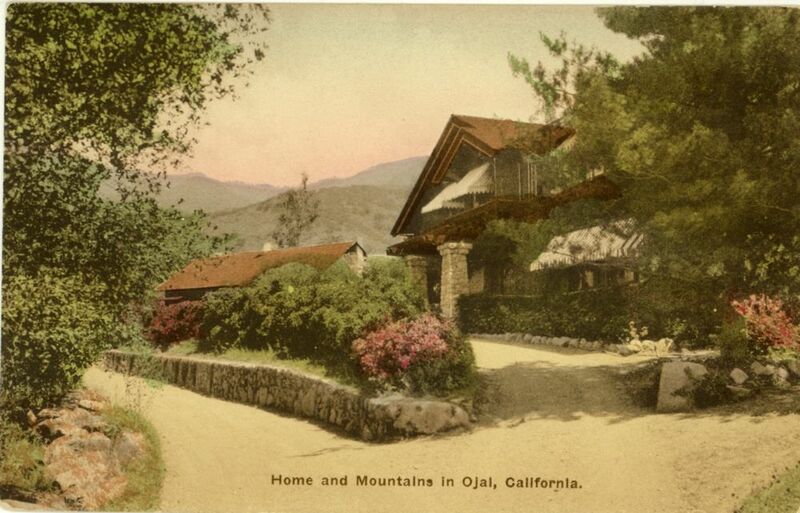 She commissioned the famous California architect Julia Morgan to design a house for her in 1908, shown in this picture, one of Julia Morgan’s first residential works. The family’s first home then became the main house for Pierpont Cottages. Note: This was one of Julia Morgan’s first residences. She is best known for designing Hearst Castle in San Simeon. I visited this area last week.Its located in the East valley area by the Thacher School.This area was called Pierpont Cottages.The cottages were first opened in 1892 at the east end of the valley by Earnest and Josephine Pierpont,Primarily to provide accommodations for parents visiting students at the Thacher School,(Located about 2 miles to the east)In that year eight cottages were constucted and at first were givin the collective name “The Overlook”. The name was changed to Pierpont cottages in 1900. “The Peppers” house was originally a Tudor/Craftsman building that showed the architectural style typical of Pierpont cottages. The main building for The overlook or Pierpont has burnt. This area is posted private, so please respect the privacy of present home owners. Chris Cook from Big Bear. Could you settle a debate for us… We have heard that in the early 70s (1972) John Lennon and his wife Yoko stayed in one of the Pierpont cottages… fact or fiction? Please do not take this the wrong way but trespassing on my families property is prohibited. Whether the tenants were polite does not change the fact that the estate is private. It would be appreciated if you didn’t encourage people to “explore” a private residential property. Fiction. By the 70’s, Pierpont Cottages were rental apartments. John and Yoko stayed at the Churchill Residence which is located within the Pierpont property. They left clothes, chopsticks in the garbage disposal and Jim Churchill’s guitar on the lawn.